Some places become popular because of their atmosphere or their history, not because the food is fantastic. 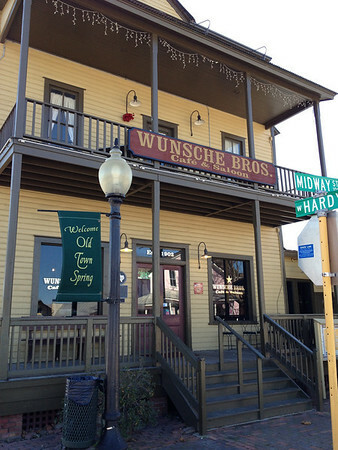 Wunsche Bros. in Old Town Spring, Texas is like that. The restaurant has been on this site for 110 years, and serves up ‘home-style’ cooking with a vague hint of German dining thrown in. 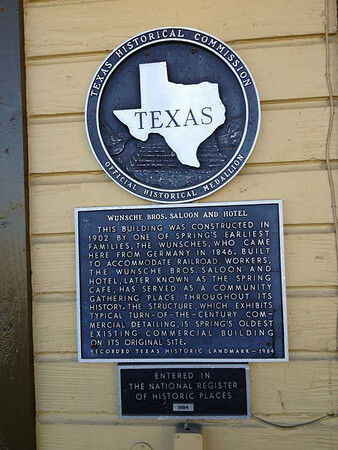 Originally built as a hotel and saloon for the railroad workers, it managed to survive demolition when the switchyard moved south into Houston. The building was the first one built in Spring, and is the oldest surviving original building. Reportedly, it was the last place in Harris (Houston) County to serve legal liquor before the start of Prohibition. In the 1940s, it became known as the Spring Cafe, later to be renamed for the Wunsche family, German immigrants who originally built the hotel. It now serves hearty portions of hamburgers, catfish, country-fried steak, and a couple dishes featuring smoked sausages. Sides dishes include fried and mashed potatoes, vegetables, stewed okra with tomatoes, black-eyed peas. In a word, this is a typical country style cafe that you find in every small town in Texas or Oklahoma. Every order comes with a thick slice of freshly baked beer bread. The complete bar serves beer on tap and in bottles. 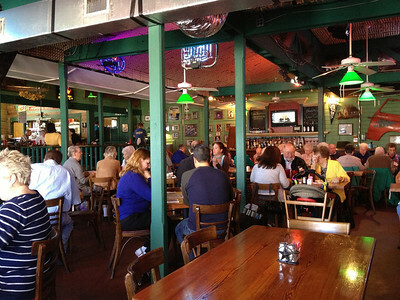 The venue is used for live music, as well, with a large central stage and plenty of table seating. Last week, I had a craving for chicken and mashed potatoes. I decided to give Wunsche Bros. another try. The place doesn’t get many single diners, I think, as I noticed that I, along with another single patron, were seated at small tables off to the side next to a drafty window, instead of in the main dining area. (Note to restaurants: single diners aren’t shamed of eating alone and, unless we ask for solitude, don’t need to be hidden in the back corner like the crazy aunt in the attic.) I ordered the chicken-fried chicken, with gravy and mashed potatoes. I don’t eat like this very often, and wanted it to be worth the calories! Your basic Brown Meal. And no, I don’t eat like this often and I eat only a few bites. It was one of the more disappointing meals I’ve had. The potatoes were very dry and unseasoned. The chicken? It was an entire chicken breast, that is, both sides of the chicken. What looked liked a nice crisp coating turned out to be flavorless, and crumbled away from the chicken at the first touch of a knife. I cut a small piece away from the plate-sized portion, intending to save the rest. A small pool of grease puddled on the plate. The chicken breast was bland and dry, as well. I ate two bites of each, and a few bites of the black-eyed peas, which were well-seasoned and not too bad. I put the chicken in a box to take home for my three dogs, drank my iced tea, and paid the bill: $12. Unless the food, service, or atmosphere is truly awful, I’ll give a place more than one try, on the chance that the chef had a bad day or that I made a poor menu selection. This, however, is the third try for Wunsche. I’ve had a hamburger there – the meat was very densely packed and dry. The beer is cold, the atmosphere lively and pleasant. I think it would be fun to listen to a band, drink a brew, maybe nibble on some fries, but I won’t ever eat here again. I think part of the popularity is the location and the history, as it’s the only large restaurant in Old Town Spring, and that it attracts the kind of people who equate portion size with value. Stop and have a beer or a margarita, but if you prefer quality over quantity, eat before you visit. ‹ What the hell is that? Mystery objects! Doing it big in Texas. Yee-haw!!! I love going to historic places and it’s even better if I can break bread there. But too bad when someplace doesn’t live up to expectations. Typical Texas fare. 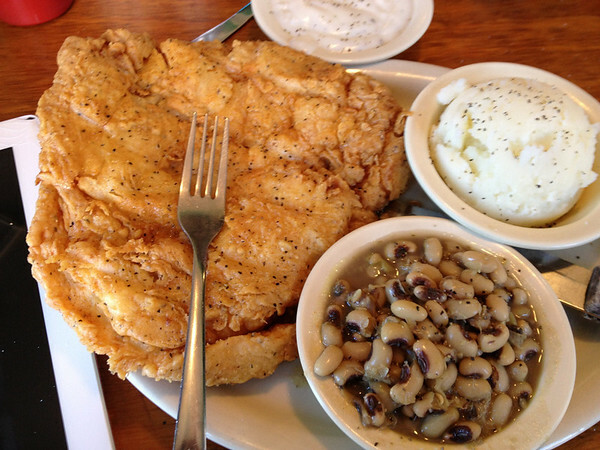 I love a good chicken fried steak and Keith’s is the best place in Odessa for one. Not any atmosphere but good food.